The Traverse City Film Festival will present a slate of free films at the Open Space in downtown Traverse City every evening from Tuesday, July 28th to Sunday, August 2nd. 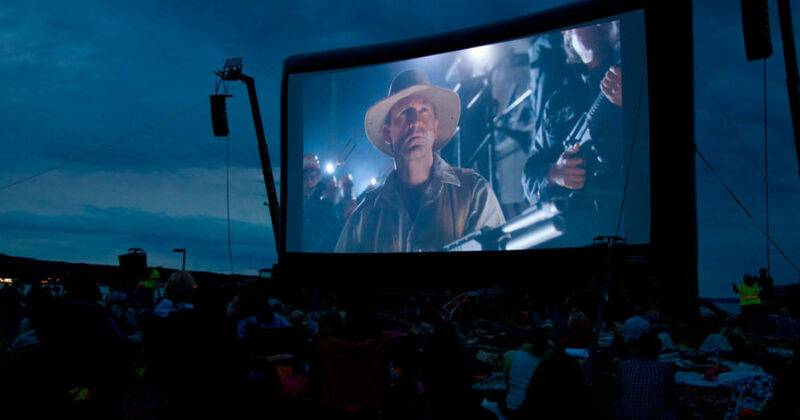 Projected onto a 65-foot inflatable screen, the following films to feature at the Northern Michigan festival include the 2015 People’s Choice Winner, a famous political satire and a heartwarming comedy. So grease those joints on your lawn chairs and fluff out your outdoor blankets: it’s going to be a good week of free Open Space movies and entertainment events at the 2015 Traverse City Film Festival. Gravity on Tuesday, July 28th: This year’s opener takes us on a space adventure and explores the human will to survive. Directed by Alfonso Cuarón. The Great Dictator on Wednesday, July 29th: Watch as Geraldine Chaplin presents her father’s fearless political satire on its 75th anniversary. Directed by Charles Chaplin. The Birdcage on Thursday, July 30th: Pay tribute to the memories of Robin Williams and Mike Nichols with this screening. Directed by Mike Nichols. The Breakfast Club on Friday, July 31th: The people have spoken. This ode to teens is the 2015 People’s Choice Winner. Directed by John Hughes. Guardians of the Galaxy on Saturday, August 1st: Don’t miss this heartfelt and hilarious movie making its debut at the Open Space this year. Directed by James Gunn. The Lego Movie on Sunday, August 2nd: Join your favorite legos for this awesome movie, which coincides with the festival’s Closing Night Bash. Directed by Phil Lord and Christopher Miller.